Our experienced team have devised a Top 10 list of the best views in Alaska! View our Alaska itineraries – our two most popular self drives are the 14 night Alaska & Yukon Highlights and the 14 night Awesome Alaska. If a fly drive isn’t your thing we also offer a great motorhome itinerary and some great cruises too! Where better to start than with the highest mountain peak in North America, Denali? With it’s summit standing at an incredible 20,300 feet above sea level, Denali (known as Mt. McKinley from 1917 until August 2015) is situated at the heart of the six million acre wild land of Denali National Park. Famous for it’s acres of untouched wilderness and abundance of dangerous, beautiful animals, Denali National Park is a wonderful place to immerse yourself in the wild, but the Denali mountain itself eclipses everything. The mountain is one of the most aesthetically pleasing in the world due to it’s base to peak elevation of 18,000 ft – the highest in the world (eclipsing the likes of Everest and K2). It truly is an amazing sight from all angles, but we think the best place to go is to the north to view the peak with Wonder Lake in the foreground. What a sight. The Chugach Mountains stretch for over 250 miles, beside the Pacific coast, and runs past the Richardson Highway, the Seward Highway, Portage Glacier Highway and Glenn Highway, which is a wonderful sight when you’re cruising along the road in your hire car vehicle – you’ll experience views from all of these highways on our Alaska & Yukon Highlights 14 night fly drive. The Chugach Mountains’s average elevation is of 4,000 feet with the highest point – Mount Marcus Baker – standing at over 12,800 feet. The mountains are protected by the Chugach State Park and Chugach National Forest near to the capital Anchorage which is great for outdoor activities. The time and place to see the Chugach would be at sunset from Anchorage, a magnificent sight of pink, purples, reds and yellows descending upon a beautiful backdrop. Situated 40 miles of Ketchikan – a stop on this great small ship cruise – and near the Yukon border, Misty Fjords is a place of incredible beauty with huge peaks either side of the inside passage which you’ll sail down to see this magnificent place. Misty Fjords can only be seen by seaplane or cruise ship due to it’s remoteness and one specific the place to check out if you go is definitely Punchball Cove, a sheer granite cliff which rises vertically up 3,150 feet – an incredible sight. The Northern Lights are amazing to see anywhere in the world, but Alaska is renowned around the world for having some of the best displays of the truly extraordinary Aurora Borealis. While the Northern Lights are a year round occurrence, Alaska’s near constant daylight in the summer makes it almost impossible to see, but in winter it’s a completely different story and you’ll see unbelievable displays – Alaskan hotels even offer Northern Lights wake-up calls to make sure you don’t miss anything special while you sleep. September until mid-April is considered ‘Northern Lights season’ and while you can see the Aurora all over Alaska, Fairbanks is considered the Mecca as it is geographically under the “aurora oval” where the Northern Lights are most often seen with midnight being the ideal time. Situated just 12 miles from Juneau and accessible via road, Mendenhall Glacier, located in Mendenhall Valley, is 13.6 miles long and continually retreating from the shores of the small lake it sits on up to the Juneau Icefield. Home to over 30 glaciers and numerous fjords, Kenai Fjords National Park covers an area of nearly 700,000 acres on the south coast of Alaska. Kenai Fjords National Park boasts abundant wildlife, alpine and tidewater glaciers and breathtaking scenery. A North-western Fjord cruise is certainly the best way to see this pristine national park and its inhabitants where you’ll be able to go to deep into the park like no other cruise can. Kenai Fjords can also be accessed from Seward on the Alaska railroad or from Highway 1. The jewel of the park is Exit Glacier, a 4 mile glacier situated in the Kenai Mountains, which is also accessible by road. You’ll find Tracy Arm Fjord and it’s 650,000 acres of wilderness just 45 miles south of Juneau consisting of two deep and narrow fjords over 30 miles long. At the end of Tracy Arm, a winding fjord with sheer granite walls, hundreds of cascading waterfalls, and some of the largest floating icebergs in all of Alaska, sits the twin Sawyer Glaciers-North Sawyer and South Sawyer which are the two views to look out for in this area, along with everything else. The fjord is home to brown and black bears, deer, wolves, harbor seals, birds such as arctic terns and pigeon guillemots. Like everything Alaska it’s incredibly vast and it’s incredibly beautiful. The wonderful looking Kennicott Glacier is situated in the Wrangell Mountains in America’s largest national park, Wrangell-St. Elias National Park which is home to an area of over 13,000 acres, 9 of the US’s 16 highest peaks and the second highest peak in North America, Mount St. Elias. Starting at Mount Blackburn, the Kennicott Glacier snakes down 27 miles to its terminus at the head of the Kennicott River with the shape of the glacier giving the bizarre impression that it has been driven over by a ridiculously large monster truck. Wrangell-St. Elias is a must if you’re heading to Alaska, but to make it extra special, you have to head to Kennicott Glacier. 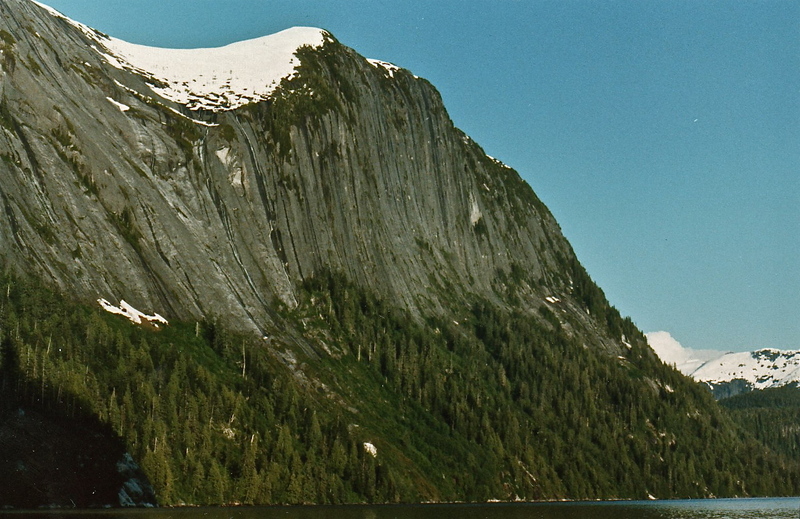 We’ve touched on the Inside Passage already, but it certainly deserves a section to itself. Weaving through the islands on the pacific coast, the Inside Passage begins in Alaska and extends for 500 mile before reaching western British Columbia in Canada before ending in Washington State, USA. The Alaska portion of the Inside Passage encompasses 1,000 islands and 15,000 miles of shoreline including an abundance of waterfalls, mountains, glaciers, wildlife, fjords, ice fields, and major towns such as Skagway and Ketchikan and the beauty of the Prince of Wales island. Alaska’s Inside Passage is beautiful and full of contrasting scenery and pure beauty – it’s a must see! The 10th largest river in the USA in terms of average discharge, Copper River is 290 miles long and is home to some magnificent sights and wildlife including its prolific runs of wild salmon which are world-renowned. You’ll see sand dunes, the Chugach and Wrangell Mountains, tons of glaciers, ghost towns and so much more along the river. View our Alaska holidays, enquire or give us a call on 0115 9610590 to book your Alaskan getaway now! Remember we’re as flexible as you want to be!